A trip to a Japanese supermarket is quite the adventure. The aisles are filled with unknown products. I feel especially overwhelmed when standing in front of the sauce stand. 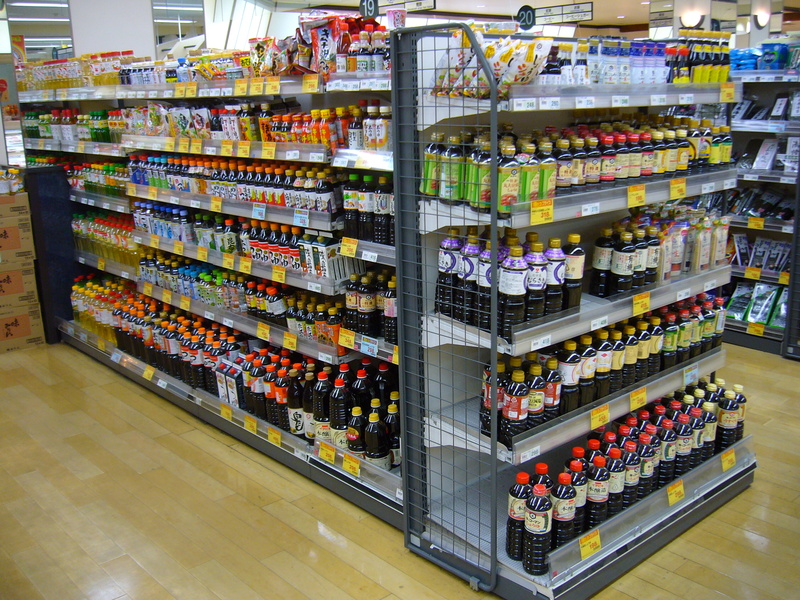 Any Japanese supermarket will have up to three aisles that are filled with nothing but sauce. There are so many different kinds: a wide variety of soy sauce (dark, light, low salt, …), salad sauce, sauce with orange aroma, sesame sauce, sake derivates like mirin, … The list is endless. 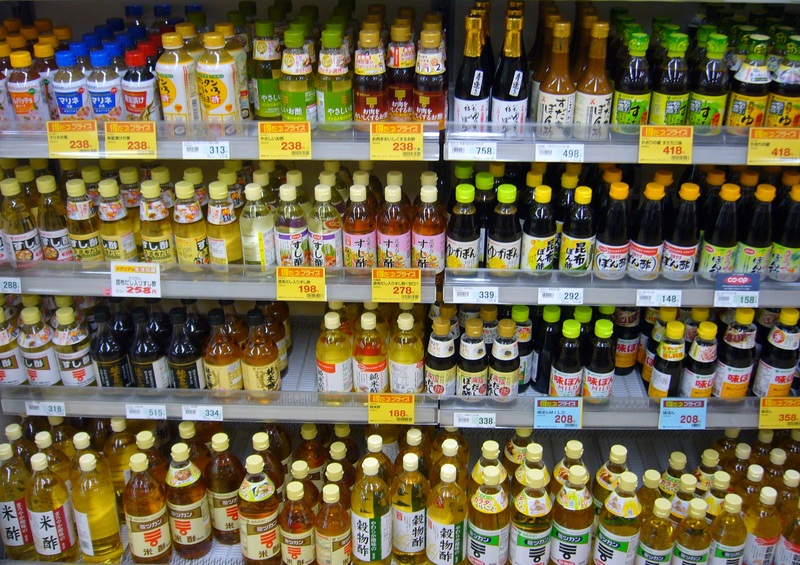 Liquids and sauces are the main condiments in Japan (as opposed to the West where we mostly use herbs). And of course I have no idea how to use most of these sauces. Even if you have come prepared and looked up a recipe beforehand, finding the sauce that the recipe requires can be quite a challenge, as most of the labels are written in kanji (chinese characters). To sum things up, facing this wall of sauce is both awe-inspiring and daunting at the same time. After returning to Belgium last month and seeing the selection of cheese in Belgian supermarkets, I imagine Japanese people living in Belgium must experience a similar sensation when being confronted with this vast array of cheese for the first time. How would they know the difference between young and aged gouda, or that camembert is actually supposed to smell like that. Some cheese is for cooking, other cheese is to put on bread. 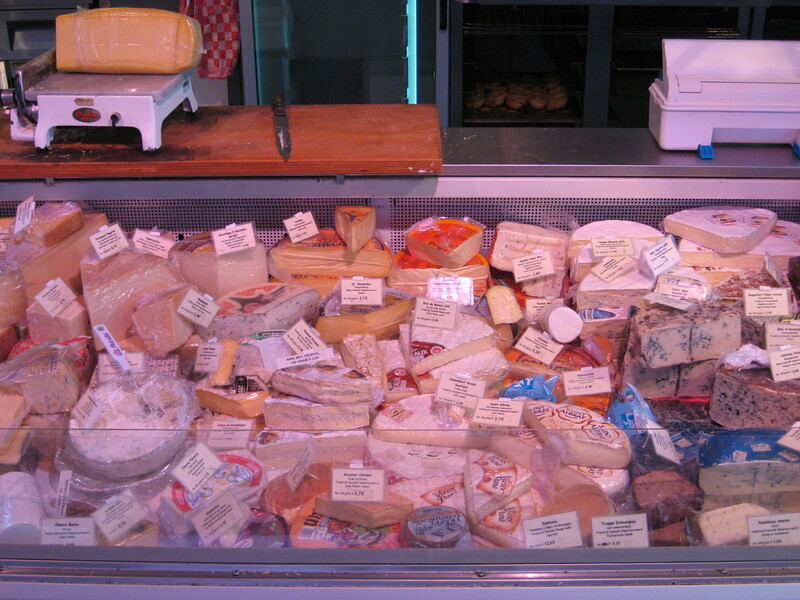 There is Italian cheese, French cheese, Dutch cheese, … There are so many options, while most Japanese supermarkets only offer one kind of cheese: a very soft, synthetic cheese, with every slice in its individual plastic wrapper. If you see a confused looking foreigner in the supermarket, desperately staring at the cheese stand (in Belgium) or at the sauce stand (in Japan), please rescue them! They need your help! This entry was posted in Food, Japan and tagged Belgium, Cooking, Food and drinks, Household, Impressions of daily life, Shopping, Supermarket by Haruko-chan. Bookmark the permalink. ★Liked ★Liked ★Liked!! I would like to click 3 more ★liked for this blog!!!! Thank you! :-))) You do know that the homecooked meals that I am talking about are yours, right? You were my guide to the sauce wall 🙂 Thank you for all those lovely meals! The shop you took photo of sauce has much more compared with other super markets. As I see them in photos,they are very colorful!I think Japanese always care the appearance of the products.Very interesting post! Hi Yuko-chan! It is indeed Meglia in Toyota City 🙂 Now that you mention it, it does have a lot more sauce than for example Yamanobu. How about Aeon? I remember feeling a bit overwhelmed there as well. All the products lined up do look beautiful. That is one of the things I love about Japan: attention to detail and sense of beauty. I’m very happy that you keep reading the blog and commenting! When you come to Belgium, we can eat lots of cheese together! Here here! I’ve found myself many-a-time just staring, slack-jawed and bug-eyed at the sauces in a Japanese supermarket. I can relate. Haha, just got a Vertigo like image in my mind of someone standing in front of the sauce stand, with all the sauce spinning in front of their eyes. And about the cheese, I had forgotten just how much cheese we have here. I actually felt a little overwhelmed the first time myself. 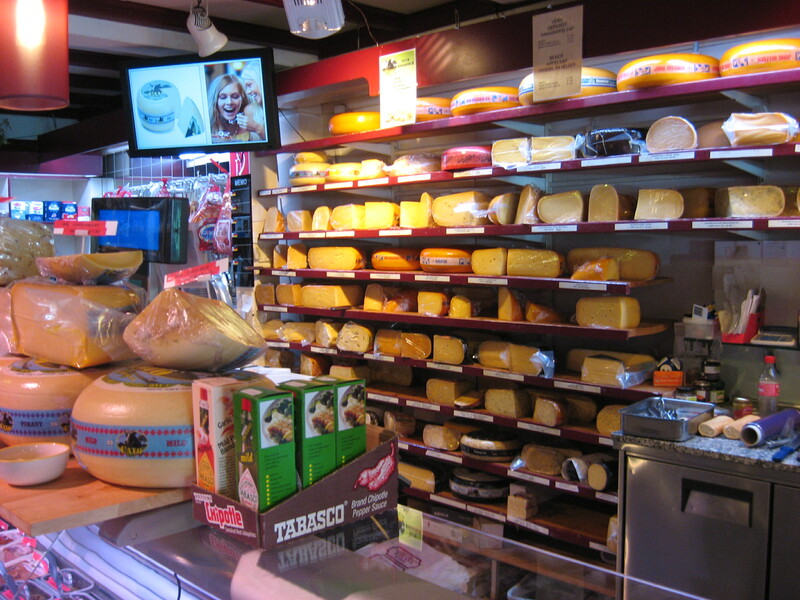 But that feeling quickly changed to ‘hmmm, cheese’ 🙂 That cheese shop in the pictures above sold a relatively soft Dutch cheese with little pieces of truffle in it. Divine! I think I have ‘mastered’ about 10 sauces by now but there is still so much uncharted territory out there! Ah, Cheese. The one thing I really miss in Japan, is a proper selection of cheese. 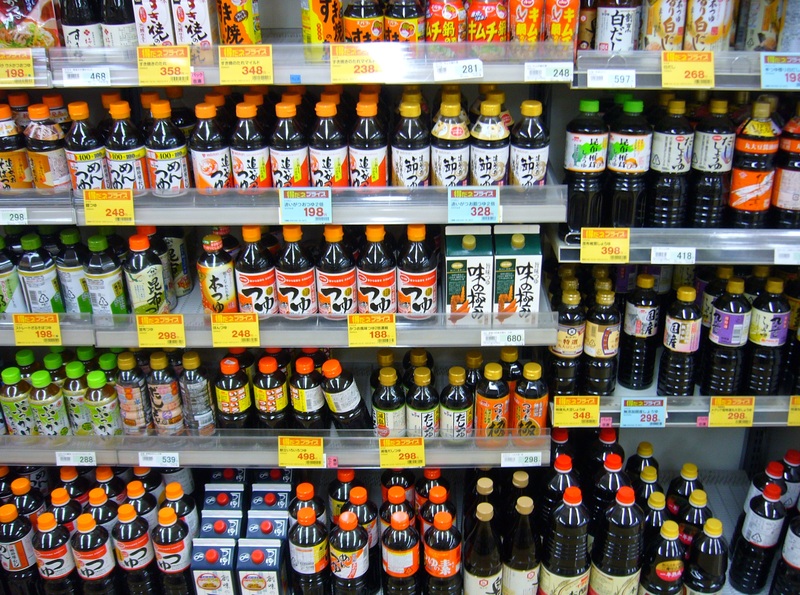 Anyway, you’ve captured perfectly the feeling of being faced with a wall of product in a Japanese supermarket and having no idea what any of it is for. My tactic for tackling the wall: whenever I am invited to eat a homecooked meal at someone’s house, I take photographs of all the sauces they used in preparing that food. I then go to the supermarket and look for the identical brand. That way I am sure I get the exact same product. I then use these sauces to copy the inspiration meals in my own kitchen. Hmm, Aussie bbq. I heard those are the best. Reblogged this on Kansai-Ben's Japan Blog 関西ベンの日本のブログ.